Vintage Plastic Pillsbury Bake Off Contest Token-1949 Price:$9.99+$2.00 S&H This is a plastic token distributed by Pillsbury Flour Company that it's owner could use for a chance to win $50,000. These were distributed in October of 1949. At the Pillsbury Bake Off in December first place was a $25,000 prize. However if the winner had one of these tokens the prize would be doubled. 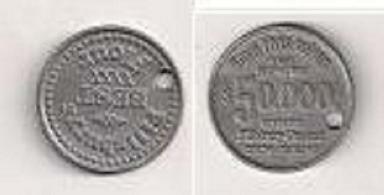 The token measures 1 inch in diameter and is in excellent condition.